The word Blog is an apostrophe-less contraction of the two words web and log. 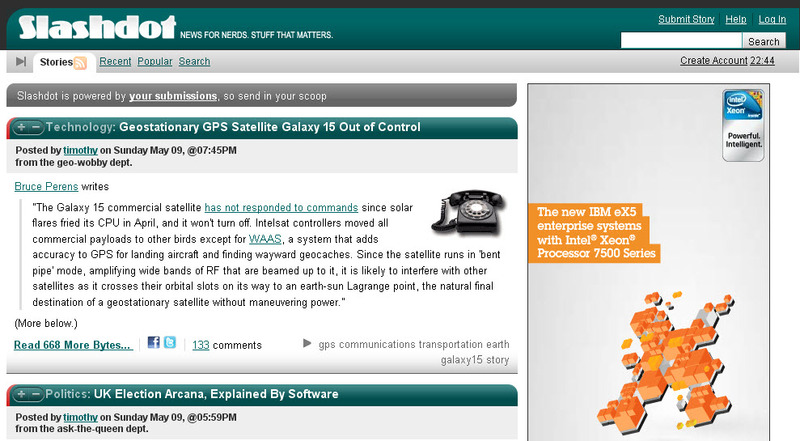 Blogs were first popularized by web sites such as Slashdot (http://slashdot.org) which have the format of a running list of entries to which users could attach comments. Over time, more and more sites such as Digg, del.icio.us, and Newsvine adopted the format, empowering users to share their opinions and generating lively discussions. Over the course of time, blogging sites and applications began to appear, such as blogger.com, blogspot.com. TypePad, WordPress, and Web Roller. These applications allow individuals to run their own web sites in the same format: a running list of short articles to which readers who are registered with the site can attach threaded comments. People who run a blog are called bloggers, and sometimes they build a whole community of readers who are interested in their blog posts. Anyone can have a blog, in fact, there are several famous people who run their own blogs. It gives people an outlet for self-expression that they would not otherwise have, and the ubiquity and wide reach of the Internet ensures that if you have something important and interesting to say, somebody will read it. Liferay Portal has a Blogs portlet which allows you to provide a blogging service to users of your web site. In fact, Liferay extensively uses the Blogs portlet on http://www.liferay.com to provide employees with blogs of their own. In addition to the Blogs portlet, there’s also a Blogs Aggregator portlet which can take entries from multiple users’ blogs and put them all in one larger list. We will go over how to use both of these portlets to create a blogging site for your users. The Blogs portlet is available from the Collaboration section of the Add → More menu. Notice that it is an instanceable portlet, meaning that it supports scopes. This allows you to use the Blogs portlet to create a shared blog to build a site like Slashdot or to create multiple personal blogs to build a site like http://blogger.com. What’s the difference? Adding the Blogs portlet to a site page creates a shared blog for members of the site that the page belongs to. Adding the Blogs portlet to a user’s personal site creates a blog just for that user. The Blogs portlet works the same way in both cases. And of course, you can change the Blog portlet’s scope to have different blogs on different pages in the same site. By default, the Blogs portlet displays the latest entry in its entirety. When you first add the portlet to a page, it has no entries, so the portlet is empty. There are several display options to let you configure it to look the way you want it to look. Before we start adding entries, let’s configure the portlet so that it displays entries the way you want them. The Blogs portlet is easy to configure. Click on the Menu icon in the portlet’s title bar and select Configuration. Beneath the Setup tab, there is another row of options. Email From: defines the From field in the email messages that users receive from the Blogs portlet. Entry Added Email: defines a subject and body for the emails sent out when a new Blog entry has been added. Entry Updated Email: defines a subject and body for the emails sent out when a new Blog entry has been updated. 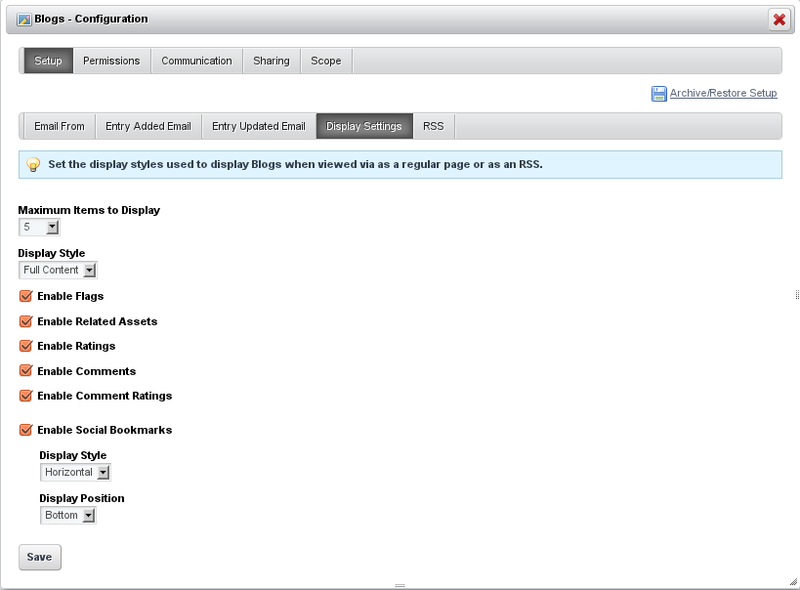 Display Settings: changes various display options for the Blogs portlet. To choose the right settings, you should think about the best way to display your entries as well as how you want users to interact with bloggers. 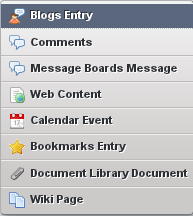 Maximum Items to Display: choose the total number of blog entries to display on the initial page. You can select up to one hundred to be displayed. Display Style: choose between full Content, abstract, or just the title. Setting this to Abstract shows the abstract, or if there isn’t one, only the first 30 words of your blog entries, with a Read More link at the bottom of each that expands to the whole entry. Enable Flags: flag content as inappropriate and send an email to the administrators. Enable Related Assets: select related content from other portlets to pull into their blog entry for readers to view. Enable Ratings: lets readers rate your blog entries from one to five stars. 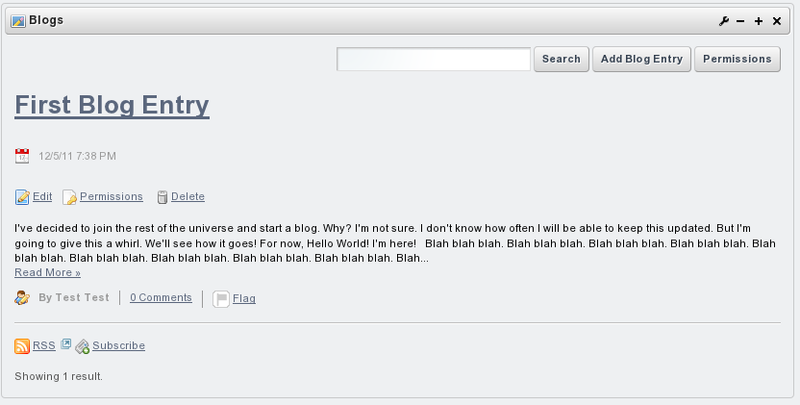 Enable Comments: lets readers comment on your blog entries. Enable Comment Ratings: lets readers rate the comments which are posted to your blog entries. Enable Social Bookmarks: lets users tweet, Facebook like, or +1 (Google Plus) about blog posts. Maximum Items to Display: determine how many blog entries will be displayed at once. The default is set to twenty. Display Style: select a simple, vertical, or horizontal display style for your blog posts. Display Position: choose a top or a bottom position for your blog posts. RSS: choose how blogs are displayed to RSS readers. Here, you can choose how you want your blog entries to be published as feeds to readers and outside web sites. Maximum Items to Display: choose the total number of RSS feeds to display on the initial page. You can choose up to one hundred to be displayed. Display Style: choose between full content, abstract, and title. These options work just like the ones above for blog entries. Format: choose which format you want to deliver your blogs: RSS 1.0, RSS 2.0, or Atom 1.0. Now that you have the Blogs portlet looking the way you want it, you’ll want to review permissions for it–especially if you’re working on a shared blog. If you have a personal blog, the default permissions should work well for you. If you have a shared blog, you may want to modify the permissions on the blog. The default settings make it so only the owner of the site to which the portlet has been added is able to add entries. This, of course, is great if the Blogs portlet has been added to a user’s personal pages, but doesn’t work so well for a shared blog. But don’t worry: it’s easy to share a blog with multiple users. First, create a role for your bloggers and add them to the role (roles are covered in chapter 12 of Part 2). Next, click the Permissions button on the Blogs portlet. A list of both portal and site roles is displayed, and currently only the owner is checked. Check off any other role or team that should have the ability to add blog entries, and then click Save. 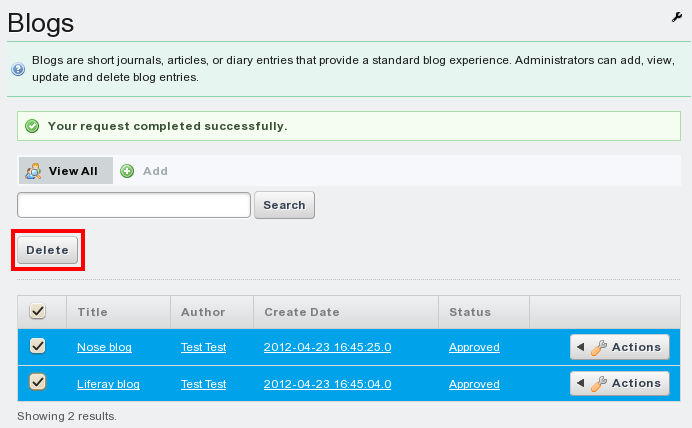 Once this is done, users in the roles or teams that you selected are able to post to the shared blog. Now that everyone’s able to post, let’s look at how posts work. There isn’t much difference between this screen and any other data entry screen within Liferay Portal. You get a title, a way of scheduling when the entry is to appear, and a rich editor that allows you to format your entry the way you want, complete with embedded images, videos, and the like. Note also that as you type, the entry is automatically saved as a draft at periodic intervals. This gives you peace of mind in using the portlet from within your browser, since you won’t lose your entry in the event of a browser crash or network interruption. You can also tag your entries using the same tagging mechanism found everywhere else in the portal. The Blogs portlet also supports trackbacks and pingbacks. Trackbacks are special links that let you notify another site that you linked to them. For example, if you wanted to write an entry in your blog and reference some other site’s entry, you might put the URL to the other entry in the Trackbacks to Send field. If you have multiple URLs you want to send trackbacks to, separate them with spaces. If you want others who link to your blog to let you know about the link via trackbacks, leave the Allow Trackbacks box checked. This generates a URL that is displayed with your blog entry. Others who want to link to your entry can use this URL for the link, to send trackbacks to your blog. Note that trackbacks only work when the protocol is supported by both the linker and the linkee. A newer way to support similar link notification functionality is pingbacks. Pingbacks are XML-RPC requests that are similar to trackbacks except they’re automatically sent when you link to another site. They’re easier to use because you don’t have to do anything extra: if you link to another site in your blog entry, Liferay sends a pingback to the other site to notify that site that you linked to it. Similarly, if someone links to your blog entry, Liferay can receive a pingback from that person’s site and record the link. You can enter a description of your post beneath the Abstract heading, and this can be used by the Abstract display style. Below this is the Categorization heading, where you can attach tags and/or categories to your blog entry. You should definitely consider doing this: it improves search results for blog entries, and it gives you more navigation options that you can pass on to your users. For example, you can add the Tags Navigation portlet to another column on your blogs page, allowing users to browse blog entries by tag. Below this is the Related Assets heading. If there’s some other content in the portal that’s related to your blog, you can choose it here. For example, you might want to write a blog entry talking about a particular discussion that happened on the forums. To link those two assets together, select the forum thread under Related Assets. You can see that in the summary view, you don’t see the trackback/pingback link, and you only see the number of comments that have been added. If you were to click the Read More link, you would see the entirety of the article, all the comments in a threaded view, and the trackback/pingback link which others can use to link back to your blog entry. The full view of the blog entry also contains links to share blog entries on social networks, such as Twitter, Facebook, and Google Plus. This gives your readers an easy way to share blog entries with friends, potentially driving further traffic to your site. As you can see, the Blogs portlet is a full-featured blogging application that gives you and your users the ability to enter the blogosphere with an application that supports anything a blogger needs. Of course, Liferay is a portal, and as a portal, it excels at aggregating information from multiple places. For that reason, it also includes the Blogs Aggregator portlet so that you can “bubble up” blog entries from multiple users and highlight them on your site. Let’s look next at how that works. You can set up a whole web site devoted just to blogging if you wish. The Blogs Aggregator portlet allows you to publish entries from multiple bloggers on one page, giving further visibility to blog entries. This portlet is also very straightforward to set up. You can add it to a page from the Collaboration category in the Dockbar’s Add → More menu. If you click Configuration from the menu button in the title bar of the portlet, the Blogs Aggregator’s configuration page appears. From here, you can set several configuration options. Selection Method: select Users or Scope here. If you select Users, the Blogs Aggregator aggregates the entries of every blogger on your system. If you want to refine the aggregation, you can select an organization by which to filter the users. If you select Scope, the Blogs Aggregator contains only entries of users who are in the current scope. This limits the entries to members of the site where the Blogs Aggregator portlet resides. Organization: select which organization’s blogs you want to aggregate. Display Style: select from several different styles for displaying blog entries: title, abstract, body, image, or quote. Maximum Items to Display: select maximum number of entries the portlet displays. Enable RSS Subscription: creates an RSS feed out of the aggregated entries. This lets users subscribe to an aggregate feed of all your bloggers. Show Tags: for each entry, displays all the tags associated with the blogs. When you’ve finished setting the options in the portlet, click Save. Then close the dialog box. You’ll notice the Blogs Aggregator looks very much like the Blogs portlet, except that the entries come from more than one author. This makes it nice and familiar for your users to navigate. 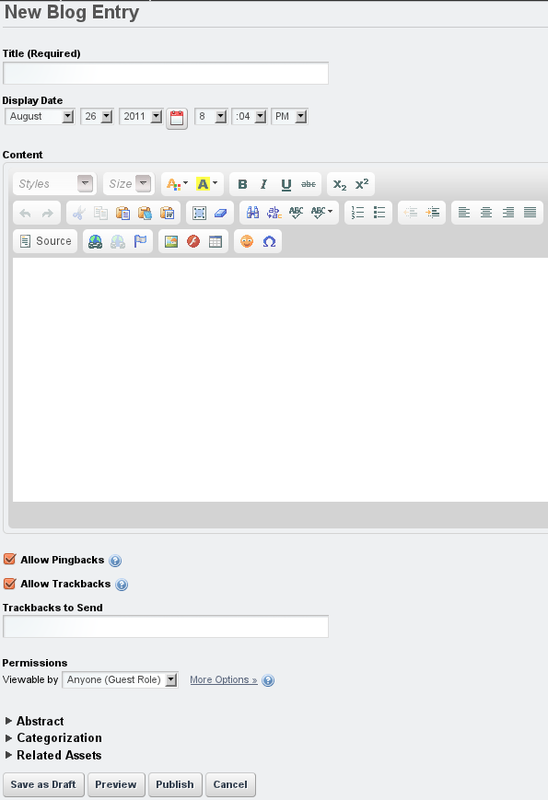 In the Control Panel there’s a portlet for managing your site’s blog entries. Most of the time, the Blogs portlet is the only tool you’ll need to manage your blog entries. If, however, you need to massively delete blog entries, the blogs administrator portlet is the perfect tool for you. 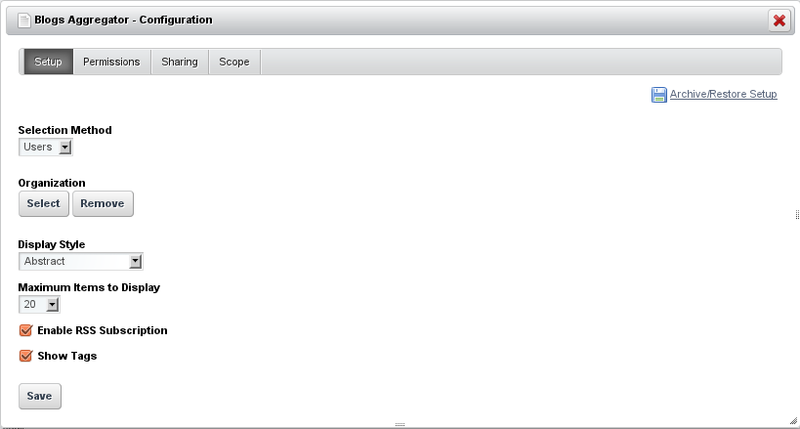 Figure 7.21: The Blogs Administrator portlet lets you delete large sets of blog entries. Note that it’s only for batch processing of blog entries; for the full set of tools for managing blog entries, your best bet is to use the Blogs portlet. We’ve already talked a little bit about connecting content across the portal by using Related Assets; now let’s take a look at the Related Assets portlet.